Ministry of Justice of the Republic of Lithuania prepares amendments to the civil code, by virtue of which a child could have both names: its father’s and mother’s. It would ease the life of Lithuanian citizens who are paid emigrants and those who are married with foreigners. Citizens of Lithuania get married increasingly more with foreigners. In some countries it’s accepted to give a child a double surname. Lithuanian citizens who didn’t get married officially and live abroad declare the will of naming a child after its father and mother. 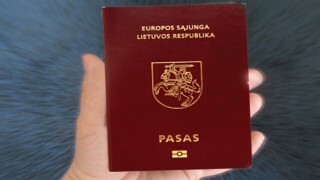 Ilona Jurgutienė, the director of registry office of Vilnius confirmed that Lithuanian inhabitants staying abroad give their children double names due to practical reasons: if a couple living in Britain did not get married and the child has the name of one parent in the documents, problems arise while applying for allowances. In accordance with the present law, double surname can be given to a child only when a mother has double name: a maiden name and a husband name. Audris Kutrevičius from the Ministry of Justice of the Republic of Lithuania admits that having a double surname in Lithuania might be bothersome: “While preparing amendments to the civil code we paid attention to the fact that a double surname can bring more troubles than a single one. There is usually not enough space for including one name in application forms”. The Ministry of Justice applied for an opinion to the Commission of the Lithuanian Language while working on the project. ‘Language policy’ expressed an approval. Aistė Pangonytė, the Senior Specialist of the Commission said that there is no habit of naming a child after both parents in the Lithuanian culture; however, it’s consistent with the Lithuanian language rules. “Double surnames are approved in Italy, Spain and other countries. While getting married with the citizens of these countries, Lithuanians usually want their children to be given double name according to the local habit. (…) We surveyed the names of children who were born on emigration and we noticed that emigrants give their children second surname as a second forename as in the countries where they live the second surname is put in the slot intended for a forename. Thus, it would be better if they had the possibility of giving a child second surname.” – A. Pangonytė says.